During every person’s working life, there comes a time when you have a question that could be answered by having access to the right data. Unfortunately, the time and effort required to find that data, package it the right way, and send it to an analytics or business intelligence tool present a formidable obstacle to answering the question. Two years ago, Redpoint partnered with Dremio to solve this problem. This morning, after an enormous amount of hard work from the team, the company has made its product publicly available. Interviewing data analysts as part of a year long research project, we kept hearing the same three problems things. First, how do I find the data that I need? In any company of scale, there might be tens to hundreds of different data sets. Which is the right one for my needs? Second, I need to combine these data sets in a the right way, but each data set speaks a different language: Elastic, Hadoop, Oracle, MySQL, HBase, S3 and so on. I might know one or two of these languages, but most users haven’t attained fluency in all of them. Third, once I’ve synthesized the data set I need to answer a question, I want to publish that data to an analytics or BI tool. How can I make sure that this new data set is available to a Looker Look or a Tableau worksheet? Fourth, I want all this data to be up-to-date, and fast, so when I analyze the data set, everything happens quickly and I can iterate to answer my question fully. Dremio solves all of these problems. 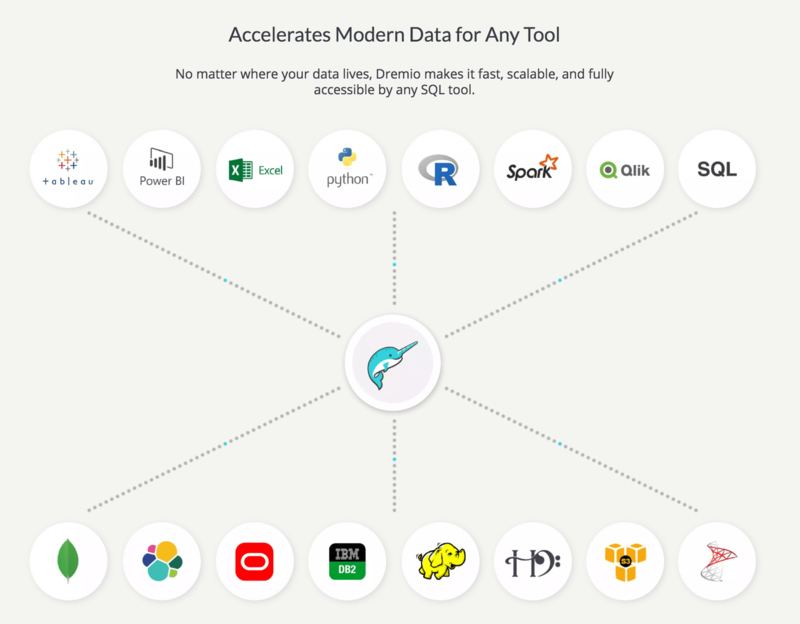 In the same way that Amazon Web Services democratized software infrastructure for engineers, Dremio empowers data analysts to find, create and publish the data sets they require, simply and quickly. Dremio is the software that enables Self-Service Data access.